Nowadays, the digital marketing industry is rapidly growing. It is making use of different types of digital technologies to promote your business. It is really important for you as a brand to know what will and will not work in looks to your digital marketing efforts. With the industry showing a huge projected growth potential of trained professionals, many students, graduates, and professionals are looking to get into the digital marketing field. This has driven to choice in terms of digital marketing courses in India. When it comes to digital marketing training, there are many institutions are provides hands-on training. In order to sustain and enhance a career, they have created various training programs in the area of digital marketing. 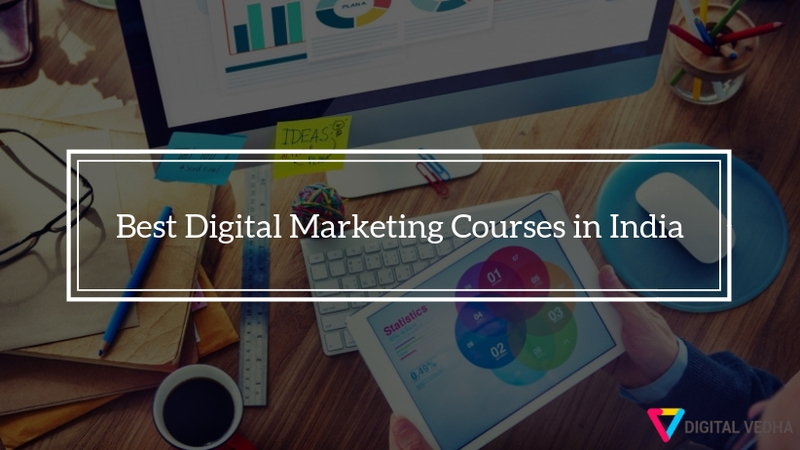 Here is a list of the best digital marketing courses in India that currently offer digital marketing training. DMC offers best digital marketing courses in India. It will help you to become a successful digital marketer with in-demand skills. The digital marketing course syllabus is designed by the industry professionals. Besides, it will prepare the students for the most in-demand digital marketing certificate exams like Facebook Blueprint, Google Ads, Google Analytics, YouTube Advertising, Bing Ads accreditation, and Twitter Marketing. EduPristine is one of India’s best training providers for international certifications in Finance, Accounting, Big Data, Hadoop, and Business Analytics. They also provide the option for both online and offline training program. Their training institutes are established in 12 different cities in India which cover the major cities like Delhi, Banglore, Mumbai etc. By the completion of the course, the candidates will get a Certificate of Excellence in collaboration with “Microsoft IT Academy Program”. Simplilearn is renown digital marketing institute which based in Banglore, India. It also provides certification programs in more than 300 courses. Primarily, it was just a blog with useful tips and then it evolved into a training company. The Digital Marketing program is named as “Advanced Online Marketing Certification Program”. Besides, it provides both online and offline training program according to needs of the student. They have 2000+ qualified trainers and 400+ courses. Moreover, it also assists you in getting the OMCP certification. Digital Vidya is a company which was founded in 2009. It built exclusively for digital marketing and data analytics training. They have partnered with several leading companies GM, eBay, and Citi bank for digital marketing. Besides, they are the official training partner for Google India. It also provides the best online and classroom-based courses to students, entrepreneurs, and working professionals. They have trained over 20000+ professionals from 10000+ brands in more than 1200 training sessions. UpGrad was founded in 2015 and Its vision is to help marketers understand marketing as a whole rather than just concentrating on just piece of the puzzle. The quality of their digital marketing training is top notch and the list of faculties they have is impressive. Their training methodology involves three components – learning, experiencing, and real-life business needs. They have partnered with the luminous minds in the industry to improve their training programs. NIIT is regularly looked up as a one-stop training center for technology-related knowledge. It has three months nano program in Digital Marketing Education, which assists students to learn & develop internet strategies during the course. So that, you will discover them as best digital marketing institute in India. Their dynamic curriculum allows you to learn different aspects of the Digital world and ride smoothly on the wave of digital disruption. They insist that they have trained 40,000 professionals so far. Moreover, they have partnered with the Digital Marketing Institute which is an Ireland based company. It helps them to provide the content and course materials. AIMA offers a Professional Certification Programme in Digital Marketing and Analytics (PCPDMA), which entails live online classroom training. Although, they have partnered with Digital Vidya for the content & course materials. AIMA’s digital marketing course is separated into 6 modules, which incorporate: SEO, SEM, SMM, Web Analytics and Email Marketing. Learning Catalyst is a Mumbai based company which provides a wide range of courses in the web/mobile/digital marketing domain. They have centers in 7 Indian cities (Bangalore, Chennai, Mumbai, Ahmedabad, Delhi, Pune, and Hyderabad) where they conduct courses of different durations on SEM, SEO, SMM. Besides, they conduct an online course on Google Hangouts. In addition, they are providing full time and freelance job support. The Delhi School of Internet Marketing provides an all in one advanced digital marketing course for job-seekers, business owners, and working professionals, at their training centers in Delhi and Bangalore. DSIM course trains students about how to do Social Media Marketing, Getting ranked on search engines, landing page creation & uttering right emails to prospects. Their digital marketing program provides you with knowledge on 17 different modules of digital marketing and practical exposure. Their advanced digital marketing course is perfect for all job seekers, entrepreneurs, and professionals in India. At the end of the training program, you will get 9 certifications in your resume including their DSIM Certificate. Digital Academy is one of the leading digital marketing training institutes in India. They have numerous short term and long term courses. Besides, they have trained more than 5,000 people so far in this field. The digital marketing training is available online where you can select for either weekend only or daily class option. They offer 5 months duration course in Digital Marketing which allows the user to get well-grounded learning about SEO, SEM, SMM, Email Marketing and other essential topics of Digital Marketing. The training material provides the skills participants to excel in their individual domains by applying the hands-on knowledge and experience. Hence, these are the best digital marketing courses in India. The success of this digital marketing courses will eventually be based on the quality of digital professionals they send into the industry and how well they achieve the obtained knowledge & digital skill sets.